In some ways the Aztec empire was literally buried when the Spanish arrived. But Aztec artifacts continue to be found, which give us new and often surprising insights into the empire as it was. We're going to look at some of the most important artifacts that have been discovered. Exploring the sacred precinct of Tenochtitlan (now downtown Mexico City) in 1994, archaeologists discovered a huge clay statue - almost 2 metres (6 feet) tall. The terrifying figure represented a form with much of its skin ripped off, with a liver hanging out. Holes were in its head, which many believe once held curly human hair. Some believe the worship of Mictlantecuhtli involved ritual cannibalism. 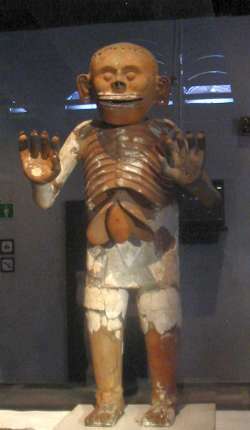 This figure, which probably dates from about 1480, was the god Mictlantecuhtli, the god of death and the ruler of the underworld. His hands are claws, held out in a menacing fashion. Curly hair was typical of the gods of death and earth. It represented chaos. Was it the hair of victims who had been sacrificed which once adorned the head of this statue? Carved from basalt, weighing almost 25 tones, it was lost under Mexico City for over 300 years. Its discovery in December 1790 renewed interest in the civilization of the Aztecs. The Codex Florentino has traditionally been one of the main sources of our information about the Aztecs. It is actually 12 books compiled by Bernardino de Sahagún, a Franciscan who spoke the native language of the Mexica people. The codex was written with pictures, Nahuatl and some Spanish, and a complete translation out of the Nahuatl only became available in 1979. The reliability of the codex has been hotly debated. Some feel it represents only what the Spanish wanted to see, not the real Aztec world. Others believe Bernardino de Sahagún mostly copied what was told to him by reliable sources. The continuing discoveries of Aztec artifacts in Mexico will no doubt increase our understanding of both the empire and the famous document that first introduced it to the old world. Discovered perhaps 300 years after it was made, this was a very unusual find among other Aztec artifacts. Items like this don't usually survive long enough to be found, but this one was in incredibly good condition. The shield is decorated with a stunning mosaic of feathers, with feather tassells hanging down, and a feather fringe around. A mysterious blue figure stands out on a red background. The blue figure is thought to be a coyote. The coyote was a patron of elite Aztec knights, as was the eagle and jaguar. But is it really a coyote? It has been suggested that it could be the water monster Ahuizotl of Aztec mythology. If that's the case, the shield may have belonged to the warrior ruler of the same name. This shield showed the incredible artistic ability of the Aztec people, and the importance of ceremony to the Aztec warrior class. See remarkable images of this Aztec artifact. Also called the Teocalli (temple) of the Sacred War, the monument was commissioned by Moctezuma II to commemorate the New Fire Ceremony of 1507. It was discovered under Mexico City's National Palace in 1831. The throne is incredibly ornate and symbolic. It left no doubt that the one who sat in it (if someone did - there's some debate about whether it was actually used as a throne or not) believed himself to be commissioned by the gods to be the ruler of central Mexico (if not the world). The monument itself represents a temple. On the back is a nature scene with an eagle on a cactus (representing the founding of Tenochtitlan (Mexico City). Being seated on the throne meant being seated over the earth and the underworld, with the past behind you. The throne represented the connection to the cult of the sun and blood sacrifice (hence the term sacred war). The stone shows Moctezuma himself and a priest to the god Huitzilopochtli (or perhaps the god himself). Here are two significant discoveries of or about Aztec artifacts that have been made just in the past few years. There's no doubt much more waiting to be found! 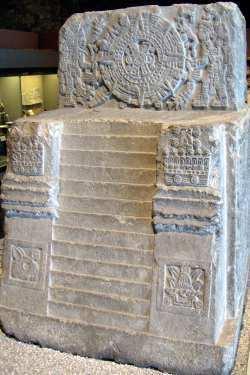 Decoding Aztec equations: In March 2008 scientists decoded records from the city of Tepetlaoztoc. The mathematical formulas were used to calculate census information and decide on taxes. The calculations are sophisticated, using fractions and body measurements for standardization. The Aztecs had an understanding of the use of zero, as did the Mayans. The records demonstrate that the Aztecs could be practical in everyday governing - everything was not based on the beliefs of the gods. The Royal Aztec Crypt: Discovered in the summer of 2007, the crypt is filled with water. Upon initial investigation, scientists used radar and came to believe the crypt has up to four chambers. It may contain the remains of the Emperor Ahuizotl. If so, this is the first tomb of an Aztec ruler to be discovered. Read more about the crypt and the Aztec artifacts it may hold.